Currently we have available 5 pups boy born Jan 28th 2019 - weaned and ready to new home! If you are dreaming about smart four-footed friend and companion... And even don't know what breed you prefer? Take some good advice and buy a French bulldog puppy. Your life will be filled with joy and cheer. 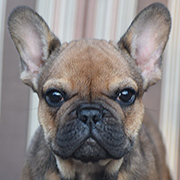 Our hobby kennel, French Passion, specializes in breeding best types of French bulldogs and is offering charming French bulldog puppies. 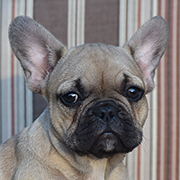 French bulldog breeder is located in Richmond, Virginia and we can also organize interstate domestic shipping. The origin of this breed is in the faraway past, and though the French bulldog is named French, Germany also claims the right of having that breed's origin roots. In the modern world the love of this breed goes far beyond the German and French borders. A charming appearance, and a nice, balanced and cheerful character gain people's sympathies all over the world. The exact and short characteristic of this breed is seen in the metaphor "A philosopher in a clown's body". The French bulldog - the smallest in the Molossus group - in spite of his small size body, has all the qualities that the Molosser group dogs have - bravery, strength and dignity. Frenchies is comfortable to keep because this dog isn't big, has a happy and well-tempered character, and gets along well with kids and other domestic animals. This dog breed is not very tall, weighs not to exceed 28 pounds, has perfect health, and lives happy long life. This type of bulldog doesn't need a lot of time to take care of. Their short hair will not take much effort to keep in good condition. Everyday walks don't need to be long and one hour a day is enough for their physical activity. You get the portrait of an ideal dog. Isn't the French bulldog perfect? For sure! French Bulldog puppy? Absolutely! There are some issues in keeping this breed. If you live at North in severe winter conditions, that isn't for one who is French bulldog, you should put warm clothes on him. You should also be careful in hot weather. And both charming and "very bad habit" of a French bulldog is that he can snore while sleeping. Though many owners think that the French bulldog's snoring is not their disadvantage and consider their favorite dog's snoring as "the angels singing". So, if you are interested in a French bulldog puppy for sale, you are welcome! At our breeder you can not only buy a French bulldog puppy in Richmond, but you can get all the necessary information about feeding and taking care of your puppy. Also you can have consultations on all questions that you may have in future. We are grateful for your attention to our dogs and breeding program and will be happy to communicate with all those who are under "Le Charme discret de la French bulldog". If you want to buy a French Bulldog in USA - Virginia Richmond (VA), North Carolina (NC), North and South Carolina (NC and SC), Florida (FL), Connecticut (CT), Washington (DC), New York (NY), New Jersey (NJ), Delaware (DE), Maryland (MD), West Virginia (WV) and Pensylvania (PA), Tennesy (TN), Indiana (IN) and Texas (TX) you are on reachable driving or shipping distance and the right way! Even buyers from Washington state (WA), California (CA) are also very welcome! We may offer careful shipping by driver.